Yes, I am so blessed to be able to read God's Word. Kevin and I are really trying to read more of it together and discussing things, which has been awesome! It is through this that I am able to get to know my Savior more; I am able to see what needs to change; I am encouraged to continue to live a passionate life. It is through the Word that I know God loves me deeply. Kevin and I have been married for almost 6 months (already??!!! Whaaaat???!!!!) I've definitely been loving married life. He truly is my best friend and I am so happy to be married to such an awesome guy. We have fun, and he makes me laugh all the time. ALL the time. :) It's been wonderful to grow together and create even more amazing memories. I can't wait to continue to grow old with him. 28 days! 28 days????? Where did the time fly!! Well, I did have Science Camp, the end of the school year Thank GOD I'm done!! ), and apartment hunting on our list of to-dos that we have thankfully checked off! whoohooo!! God answered our prayers (especially mine because I really had my heart set living in this city)..and we will be moving to ... wait for it, wait for it... CLAREMONT!!! whoohoooo!!!! We found a cozy one bedroom apartment about half a mile from the Claremont Village. We are so excited to move into our very first place together. Kevin will move in July 1st and I will make my way in after the wedding. As for our wedding plans... It's all coming together. Now that school is over, I'm planning to do nothing to RUN and CRAFT!! As of today, 265 lovely people will be attending our wedding, which is fewer than the 300 we anticipated. I'm sure that number will continue to go up in the next few weeks, but we have a wonderful venue that will accommodate the large number without feeling too cramped. Our wedding coordinator, Michelle Groom, is AMAZING, and I'm so happy that we have her on our team. She is going to pick up all of the wedding goods on June 30th, so I have just a few weeks to get everything done. At least I'll be able to relax for 2 weeks before the wedding. I can't wait!! As you all know, the new wedding fad is photobooths! It is extremely fun to take pictures, and they're great to keep as a reminder of the wedding. 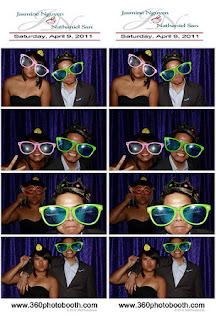 At the San wedding, there was a booth and we, of course, had to take some. We would like our wedding to be filled with fun and excitement. We want our family and friends to laugh, enjoy their time, make lasting memories, and truly celebrate this momentous occasion in our lives. We have different tricks up our sleeves and various surprises for our guests, which we hope they will like and cause them to smile. Congratulations to the new Mr. and Mrs. San!! My friends, Jasmine and Nate, got married yesterday, April 9th. They've been dating for 3 years and now they're finally married! Yay! You can tell they were both super excited; I've never seen Jazzy happier! I'm so happy for the newlyweds. I just couldn't help but think about our wedding day, especially when I had friends and family reminding us that we were next. Ahhh!!! I'm super sore from today's boot camp (the only things NOT in pain are my fingers!! ), and super tired from working on grades and report cards, so this will be short post. Short and sweet. I'm super sore from today's boot camp, and super tired from working on grades and report cards, so this will be short post. Short and sweet.